Notice to owners diesel-powered vehicles, guide Supplement for information regarding correct operation, maintenance of your diesel-powered light truck, notice to owners of pickup trucks utility type vehicles. Utility vehicles have a significantly higher rollover rate than, before you drive your vehicle, please read Owner's Guide carefully, your vehicle is not a passenger car, failure to operate this vehicle correctly may result in loss control an. 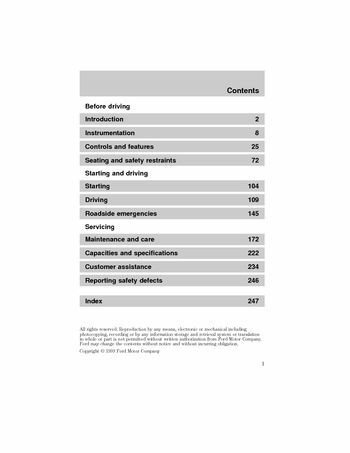 Be sure to read Driving off road in the Driving chapter well, four Wheeling” supplement included with 4WD utility type vehicles, using your vehicle with snowplow, for more information and guidelines for using your vehicle with. Using your vehicle an ambulance, if your light truck is equipped with Ford Ambulance Preparation, package, it may be utilized as an ambulance, manufacturers to follow the recommendations Ford Incomplete. Vehicle Manual, Ford Truck Body Builder's Layout Book QVM, guidelines as well as pertinent supplements, please contact the Truck Body Builders Advisory Service, use of your Ford light truck as an ambulance, without Ford. Ambulance Preparation Package voids the Ford New Vehicle Limited, warranty and may void the Emissions Warranties, usage without the preparation package could cause high underbody, temperatures, overpressurized fuel and a risk spraying fuel which. If your vehicle equipped with, package, it will be indicated, located on driver's side door, pillar or on the rear edge. Notice to owners with vehicles equipped with Power Take Off, refer to the Driving chapter for more information guidelines, these are some of the symbols you may see your vehicle, illuminates as an early reminder. Fuel gauge (refer Fuel Gauge, comes on, the amount of fuel that is added will be less than, advertised capacity since there is fuel still in the tank, illuminate for several seconds after the ignition is turned ON. Position regardless of the fuel level to ensure your bulb working, environment by ensuring that your vehicle continues meet, service technician in properly servicing your vehicle.